With NYFW right around the corner, designers are coming in on the crucial home stretch — seeing light at the end of the tunnel and living off coffee and equally stressed interns. 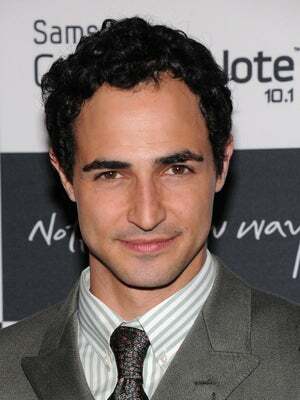 However, as a seasoned NYFW-er (he debuted at the tender age of 21), Zac Posen always manages to remain cool and collected. Following a busy year of commercial side lines, high-end collabs, and a foray into eyewear, he is ready to “rise to the challenge” that is Fashion Week yet again. Before shooting back to his studio at 11 p.m. last week (such is the life of an in-demand designer), the design prodigy took some time out to talk with us about memories, muses, and more. NYFW is right around the corner. Are you prepared? "Yeah, I mean…every season is a challenge, and you have to rise to it. It becomes creative building. It’s like pulling a Broadway musical off twice a year; you go into production mode." What are the processes you go through? "The commercial collections are built, the runway collection is built, and then those interchange with each other. Then I price it, get it into shape, and make smart decisions. Clarity and brevity is what’s important. And to treat your models respectfully." Any survival tips for Fashion Week? "Water….interchanged with coffee. Breathing breaks. Meditation. Sleep if possible." Can you remember your first fashion memory? "My sister and I would play dress up pretty significantly. I remember hand-me-down Cinderella shoes from the ‘50s with Aurora Borealis rhinestones in them. And my strongest memory of fashion was going to the Costume Institute with my parents and seeing the Vreeland exhibition, and that changed my life. She had music, lights, and it was interactive. It blew my mind." Erin O’Connor looks incredible for resort. An interesting choice — why was she right for you? "She’s wonderful. She wrote recently that she did her first fittings in my living room, and I realized at that point I’d already been close friends with her for five years or so. When I was a young teenager growing up in New York, all of those British models creating that look were my friends and my world, and it didn’t seem like I was in fashion at the time, but they were the top young working girls at that time. She’s heroic, she’s original, and she gets what it's about." She’s been off the scene for so long; was that a daring move for you? "Always, you always want to be daring in fashion. I want to embrace strong, iconic women. I want to represent women who have strength, intelligence, who are self-created, and she is all of those things. She’s created her own regality." When you’re putting pen to paper, is there a particular woman you’re designing for? "I design for the diversity of women, and what links them is a sense of confidence, the joy of life, and fun, modern glamour." Collaboration-wise, tell us, what’s next? "Oh we’ll see, we’ll see. Big news is coming…soon."